Nutrient Agar plates (NA plates) consist of a general purpose media that is used for the isolation and cultivation of a wide variety of non-fastidious microorganisms. Nutrient agar is popular because it can grow a variety of types of bacteria and fungi, and contains many nutrients needed for the bacterial growth. The professional packaging allows for an extended shelf-life that is more than double today's standard. In ongoing shelf-life tests, these plates containing NA media have maintained nutrient and moisture levels for longer than one year. Our NA plates can be used for isolating microorganisms, total plate count, and for maintaining stock cultures. OUR PLATES ARE PRE-POURED. DON'T WASTE TIME POURING AGAR. The plates are pre-poured, NA (Nutrient Agar). NA is general-purpose media, providing enough nutrients to allow for a wide variety of microorganisms to grow. They are used for a wide range of applications, including culture storage, enumeration (counting), isolation of pure cultures, or simply general culture. 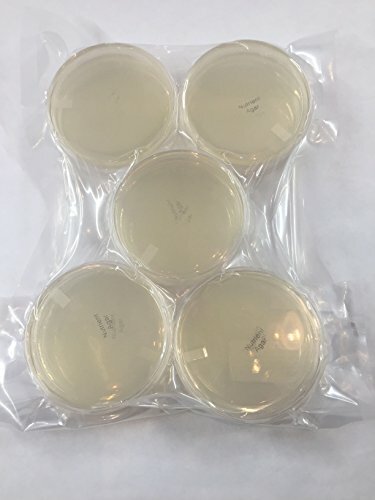 THESE NUTRIENT AGAR PLATES HAVE A SHELF LIFE OF LONGER THAN ONE YEAR, WHICH IS MORE THAN DOUBLE TODAY'S STANDARD AND ARE MANUFACTURED IN THE USA. Our plates won't crack or dry out. They have a thick layer of agar which promotes good growth, have been professionally packaged and vacuum sealed in a level 5 cleanroom for a longer shelf life. THIS PACKAGING PROCESS IS PATENT PROTECTED. We use a method of vacuum-packing our petri plates in an inert gas environment that enables long term storage of many types of petri plates at room temperature for two years or more without deterioration of the nutrient agar contained in the filled plates. Standard storage times and conditions for traditional, sleeve-packed petri plates are normally three months in a refrigerated environment. PLATE DIMENSIONS. The plates are 100mm in diameter x 15mm deep. The agar in the plates has a depth on average of 6-7mm. DESCRIPTION: 0.5% Pancreatic Digest of Gelatin, 0.3% Beef Extract, 1.5% Agar. If you have any questions about this product by Diamante Scientific, contact us by completing and submitting the form below. If you are looking for a specif part number, please include it with your message.